Constructive injection is a type of bonding. Cracks in concrete elements and brick and mortar work, often result in a less than desirable look. In addition, this damage causes the structure in question to become weakened and has an increased chance to be penetrated by moisture: something which causes a host of problems. As a preventative measure, H.V.O. is able to inject these damaged sections with a patented injection liquid which fills all hollow spaces, pores, and cracks. This creates a waterproof and structurally strengthened bond which is even stronger than before. 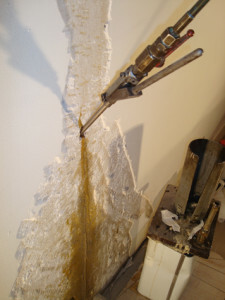 The injection process also solves problems in concrete and masonry basements by permanently sealing cracks and other damaged areas in floors and walls. H.V.O. is specialised in assessing the damage before finding the perfect injection method and solution for every specific situation.